The East End 2-Tank Morning Shallow Dive is operated by Tortuga Divers on the East side of the island. The dive departs from the dock at Morritt's Tortuga Resort which is about an hours drive from Georgetown. 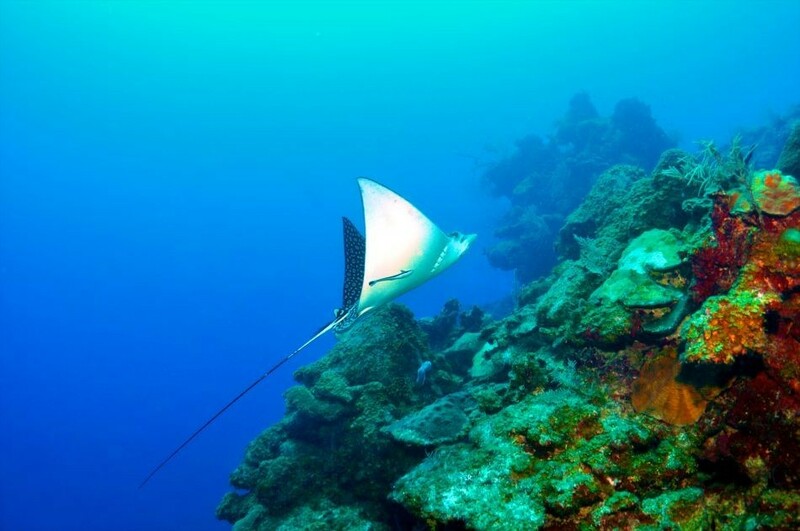 These dives are on reefs such as Snapper Hole, Cinderellas Castle, Grouper Grotto and Black Rock Reef to name a few. Both dives are to a max of 60ft, with the option of following a guide or choosing to do a buddy team dive. You must be a certified diver to book this dive. You will be required to present your Certification Card to a Tortuga Divers/Red Sail Sports Employee on check-in. *Divers with special needs should note this in the comment section of your reservations. Last dive was over 1 year ago, Refresher Course recommended. Last dive was 2-6 years ago, Red Sail Sports Refresher Course required. Last dive was over 6 years ago, PADI Scuba Tune Up Course required. Junior Divers (10-11 years old) are allowed to dive to a maximum depth of 40 feet, so they are not allowed on the two-tank dive. Junior Divers (12-14 years old) are allowed to dive to 60 feet deep. Parent or Legal Guardian must accompany the Junior Diver at all times. · Payment is required at the time of booking. · We accept: Visa, MasterCard, American Express and Discover. · Cancellations within 24 hours of the activity are non-refundable. · No shows are non-refundable. · Departure points are subject to change and are dependent on weather. · Bookings cancelled due to weather, acts of God or circumstances beyond the control of Red Sail Sports will be rescheduled or are subject to a full refund. To cancel or change a reservation prior to arrival in Grand Cayman please contact our Reservations office at 1-877-506-6368. In Grand Cayman contact Red Sail Sports at any of the locations listed on your e-ticket, or call (345) 623-5965. To cancel or change a reservation prior to arrival in Grand Cayman please contact our Reservations office at 1-877-506-6368. In Grand Cayman contact Red Sail Sports at any of the locations listed on your e-ticket.